The term "bonfire" is a word derived from an actual bone fire where Celts burned animal bones to ward off evil spirits. 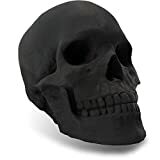 So can you just imagine what burning human skulls will do in the modern age? 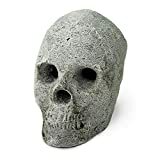 Well, when you add these cool new Fire Pit Skull Logs to your bonfire or fireplace, you won't be incinerating real human skulls, but your guests really won't know for sure. 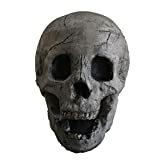 These spooky fire logs shaped like lifesized human skulls are constructed in the USA from fireproof high heat refractory materials, reinforced with steel, and can reach extreme temperatures without crumbling to ash like boring old real bones. 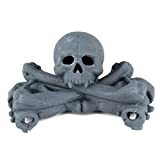 They are heavy, weather-resistant, and highly detailed. 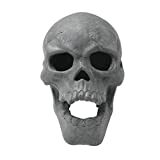 Perfect for making a macabre stack of skulls in any fire pit or fireplace, especially on Halloween night. Cool huh? 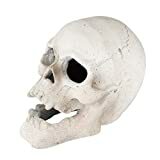 SKULL + LOWER JAW (packed separately in box).